Was the Star of Bethlehem an Alien Spacecraft? There have been many explanations for the Star of Bethlehem. But what was it in the sky that led the Magi to the birth of a King? Many plausible astronomical events have been cited such as the something known as a triple conjunction between Jupiter and Saturn. This happens when two planets come close together in the sky three times over a short period. It would have been a spectacular sight. If that’s what directed the Three Wise Men it would have had to happen just at the correct time for the birth. Perhaps it was a comet. A comet sometimes looks like an arrow coming down in the distant horizon of earth as if it is pointing at a particular place. Again this would have had to happen just at the exact time, over just the right place and lasted long enough to lead the Three Wise Men to Bethlehem. There’s a multitude of astronomical occurrences that could explain the star that announce His birth. All of them, of course, could have been orchestrated by the Lord to bring the new King into the world with a glorious sign. Or have you ever considered the possibility that the Star of Bethlehem was a UFO that shone brightly over the manger in Bethlehem? It’s not difficult to imagine since the Catholic Church called aliens our “space brothers and sisters”. The Church has been nearly obsessed throughout their history with astronomy. It keeps two huge telescopes at Castel Gandolfo, the summer home of the Pope, and employs prominent astrologers to keep a close watch on the heavens. 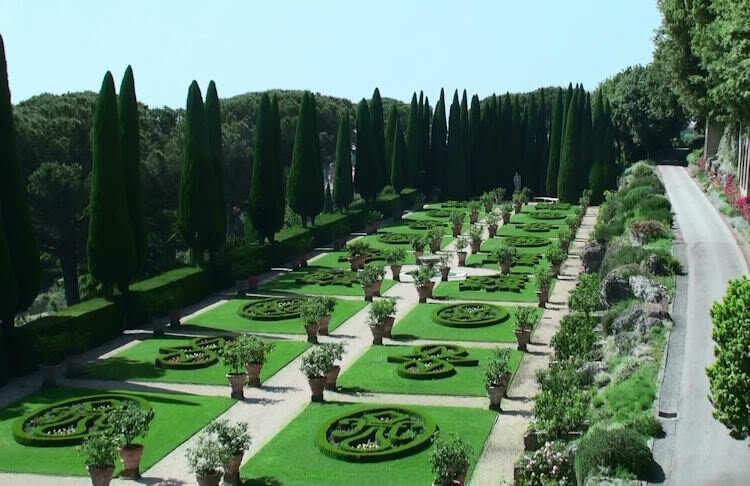 Some of the Papal Gardens appear to have crop circles from above. Are they searching for the return of aliens or have they been in constant contact since the Birth of Christ? The United Nations Announces the First Ambassador to Extra Terrestrials…Maybe? United Nations Office for Outer Space Affairs (UNOOSA) has been around since the Russians launched the first artificial satellite called Sputnik 1 into outer space in1957. The office was developed for peaceful use and sharing of Outer Space technology, how to handle space debris, to share in any benefits, and to create a united force for space emergencies to rescue astronauts. In 2010 the UNOOSA announced the first Ambassador to Aliens, Mazlan Othman of Malaysia, who would be our first contact with aliens. She is expected to coordinate humanity’s response to an extraterrestrial visit. When told of Othman’s appointment to Ambassador, an expert in space law at the U.K. space agency, Professor Richard Crowther said. “Othman is absolutely the nearest thing we have to a ‘take me to your leader’ person”. Over the years the UN has created a long list of treaties and conventions on the subject of aliens and the handling of outer space from UNOOSA. Nothing created so far can be considered a bona fide alien contact protocol. Perhaps this appointment could change that. But wait! As with anything regarding aliens this appointment is not without controversy. Although it was announced and highly publicized on September 26 2010, the very next day on September 27th UNOOSA denied naming any such ambassador! Now we are forced to wonder why the UN would deny such a position exists. As I posted in my last blog: Were the Grays Given Permission by A United States President to Abduct Humans? Don’t we already have reason to believe we have already been contacted? This leads me to believe they don’t want us to know an Ambassador to ET’s may have been selected to continue with alien contacts and negotiations. So the UN released this information and let’s the media run with it. The next day they deny it and call them out on the story. The media is humiliated, and the public is confused. Didn’t this same media confusion work for the Roswell cover up in 1942? They released the capture of a flying saucer that crashed and the very next day denied it was a UFO? It worked then and it works now….and the disinformation continues! You are currently browsing the Kathy Porter blog archives for December, 2014.